Somehow putting the photos side-by-side for the first time makes them a clearer mismatch than before. This one was a lot harder to match the drawing, short of spending well over a hundred dollars on individual colors. 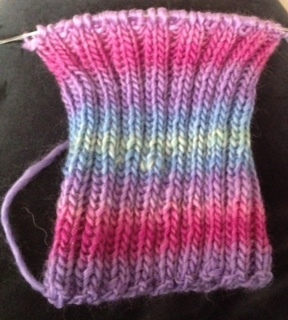 Thus the self-striping Knitpicks Chrome, which kind of surprised me in how it came out. One can never entirely tell just from the outer lengths photo’d online on one side of the ball. I expected more blue and green, and it’s in there but it’s taking too long to get to it. And the green was contaminated by a screaming yellow with greenish tints after it that didn’t go at all. I showed my young friend the yarn Sunday and she wasn’t in love with that part. Neither was I. When I got to it I broke it off and tossed it aside. More purple is good, the mom said. Well hey, look at that, the yarn started right off with it and we definitely got more purple. And pink. That one-stitch downward jog in the green only shows on this side so when I sew in a label when I’m done it will help keep that tucked out of sight on the inside. Waiting to hear back whether she wants a fold-back brim or not, since her drawing didn’t have one. Debating coming up with a second-try hat somehow, just in case it’s needed. Happy to do so. But from what I’ve seen I think she’ll like this one. Yay! Looks like a close approximation to the drawing. Hat 2b could be breaking the yarn a few more times, to get a more random stripe order, so that another green stripe gets in there? Have fun! Looks like yarn/pattern engineering, but the cause is so wonderful, I can hear the fun you’re finding in the process.